I was recently recommended the book “Living with Natives – New Zealanders talk about their love of native plants”, jointly edited by Ian Spellerberg, professor of nature conservation at Lincoln University and Michele Frey, an environmental planner. In the book, 44 New Zealanders, from politicians, artists to farmers and business people, talk about their relationship with native plants through short essays accompanied by plentiful photographs (and paintings, in the case of artist Diana Adams – see painting left). Each essay ends with tips about growing natives from the author, many of them very wise – and some even profound! The reason why had been drawn to this book at this particular time was because it included a story about Pit Park, a disused wasteland in eastern Palmerston North, which was once a quarry for clay for a local brickworks, and later became a general dumping ground for asphalt, concrete and even the odd car body. A group of locals lobbied the city council unrelentingly for several years to make it a park, and then volunteered many hours of their own time to replant the area with native trees, originally all with privately donated seedlings. Establishing native trees again on an area that was once lush totara forest was challenging, given that the topsoil had been been completely removed. Trees were planted very closely to ensure that the inevitable fatalities would not leave large gaps, and also facilitate soil-building, as the growing shrubs and trees drop their leaves and bark on to the subsoil building up a layer of humus. The appearance of large, fat worms are testimony to the success of this approach. Even if the planting projects that many of us engage in are not quite as ambitious and virtuous as this one, many of us now opt for native plants for our urban or rural properties. While native plants tend not to compare to the vibrancy of colour of exotic (especially flowering) species, they are valued highly for their texture, and of course for the fact that they are generally evergreen. But their greatest value today is perhaps in their ecological benefits, the fact that they attract and provide habitats for bird and other species that are indigenous to New Zealand, thereby contributing to the re-establishment of a much-depleted indigenous ecosystem. However, it is easy to forget that it has not always been this way. 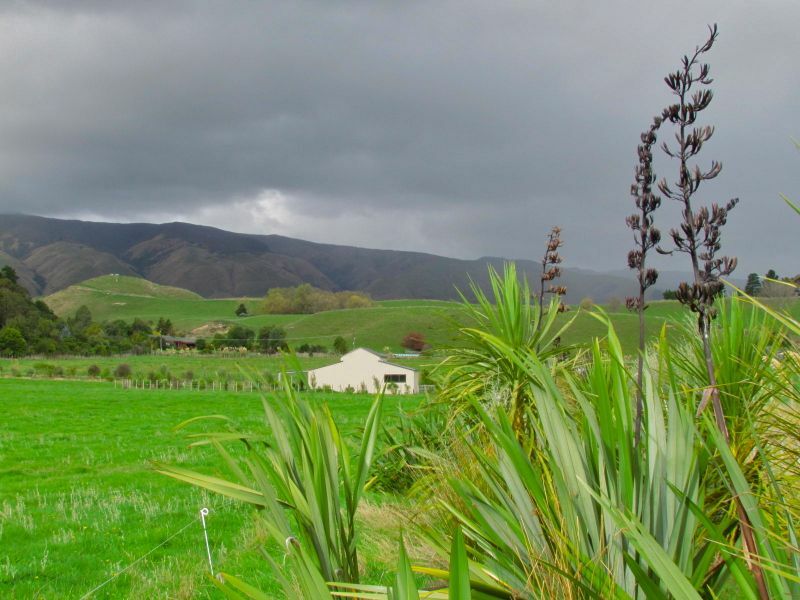 Hiwinui farmer, Dave Stewart, has for the last several years engaged in the planting of native trees along the gullies of the family farm that was originally bought and “broken in” by his great-grandfather and namesake in 1886, an immigrant from Scotland. He laughs about the fact that he is slowly undoing all his ancestor’s hard work eradicating the forest that once grew there. But he also reminded me of one simple but practical fact. Until the 1980s, it was not possible to buy native trees at commercial nurseries, so anyone who had a burning desire to plant natives on their properties had to propagate the plants themselves (or surreptitiously acquire them from a local bush remnant). Apparently one of the first native trees to appear at nurseries (at least in the Manawatu), was the lemonwood (Pittosporum eugenioides), and remains a popular choice today both as a shelter-belt plant for farms and lifestyle blocks and for urban gardens. Top: “Lakeside manuka”, by Diana Adams. Not to be reproduced without artist’s permission. 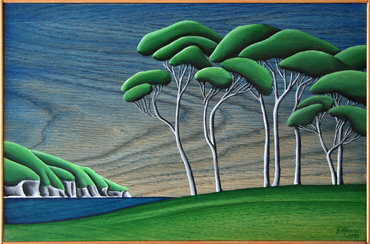 To see more of Diana’s artwork see her website. Middle left: Planting by volunteers at Pit Park, from the Pit Park Facebook page. 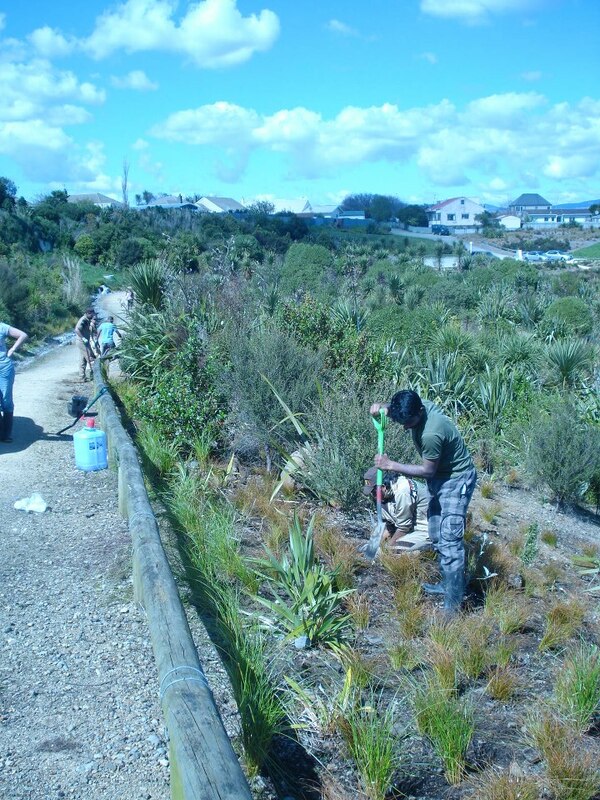 Above right: Part of a shelter-planting on a lifestyle block in Pohangina. Photo by C. Knight.